You don't have to be a gardening expert to grow winter vegetables in Georgia . 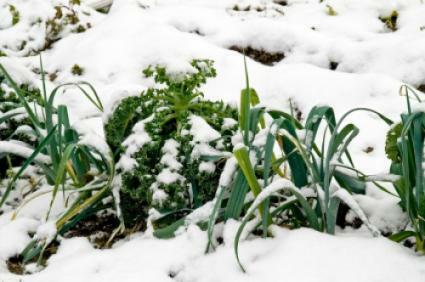 In fact, winter gardening may be much easier than spring planting or summer harvest. There are certainly less weeds to pull and watering is less of a chore because you don't have to deal with 100 degree heat. By following a few simple guidelines and understanding the growing conditions for your area, you can turn your winter garden into a freezer full of homemade soups and casseroles. Georgia hardiness zones range from 7a in the northwest portion of the state to 8b down near Savannah. Due to the large fluctuation in temperature and frost dates, make sure you choose plants cultivated to grow in your area. The first frost dates even in northern Georgia are mid-October so you should be able to plant seedlings before the ground gets too cold for them to grow. The key to successful winter gardens is insuring the soil stays warm enough for the plants to reach maturity. The easiest way to accomplish this is by using raised beds. A raised bed allows the sun to warm the soil more quickly. This is especially important since the plants will get less daily sunlight during the winter months. Another tool you may want to use is a cloche or cold frame. Both items create a "greenhouse effect" by keeping the heat from the sun's rays closely around the plant without depriving the leaves of direct sunlight. Cloches and cold frames also protect tender plants from wind. After consulting the frost dates for your area, use a calendar to determine when plants need to go in the ground. Subtract the number of weeks until maturity from the first frost date to decide when to plant. Ideally, winter Georgia vegetables will have at least a couple of weeks of harvest time before going dormant for the winter. Plants such as root vegetables that you do not expect to harvest until the spring can be planted several weeks after the first frost date but you will need to make sure the soil is still loose enough to use. If the ground is hard, add amendments such as peat moss, vermiculite and compost to make it more friable. After planting, cover with a thick layer of mulch in order to preserve moisture and retain heat at the roots. Check the moisture levels periodically by placing your finger approximately two to three inches below the soil's surface. If it feels dry, you will need to water. If it feels moist then wait a few days and check again. Monitor your garden closely for signs the plant is ready to harvest. Vegetables planted in winter gardens may take longer to mature due to the reduced amount of daily sunlight. In areas of southern Georgia, you may be able to get two harvests from certain plants such as broccoli. Simply cut the head off the stalk when they are not quite full sized. The stalk should then have time to produce a couple of smaller heads before winter takes full hold.